Some people really do hear what they want to hear – especially if it includes Emma Watson and Margot Robbie appearing as lesbians in a film together. 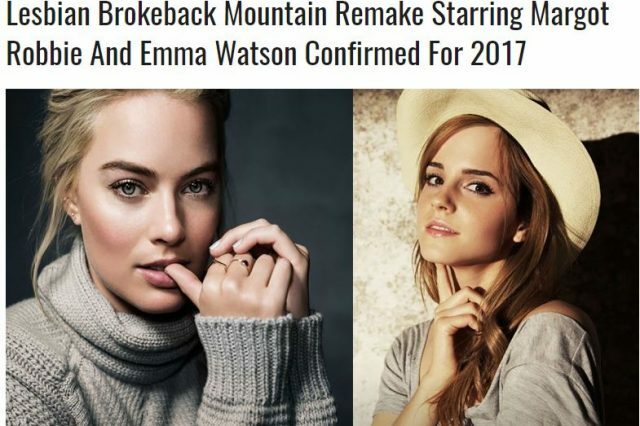 Satirical news site The Portly Gazelle actually keeps crashing because so many of you are foaming at the mouth over the idea of a Brokeback Mountain remake featuring the two actresses. All stories on this site are satire and the opinions expressed to not belong to any real people. If persons appear in the picture they have nothing to do with the story. [They] were both beaming with excitement at infusing their own touch on the threefold Oscar winner flick. When asked what they were expecting from some of the more raunchy girl-on-girl scenes that are inevitable, they didn’t seem to have any qualms. “Us both being straight won’t be a problem, we’re actors, it’s just something we have to do”. Even though this was just a joke, we kind of now hope that some eccentric Hollywood producer responds to the hype and pours a load of cash into actually making this happen.